Pressure Treated | Cedar | Tigerwood | Composite. 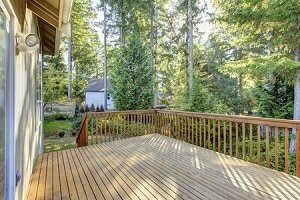 Building a deck / fence? Let us help with an innovative plan to fit your budget. 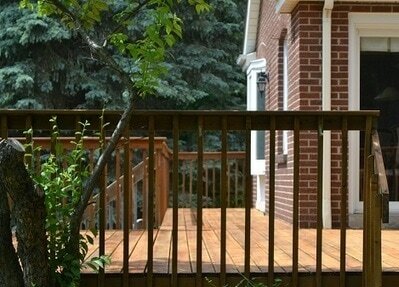 York Region's Deck & Fence Repair and Restoration Contractor. ​Decks reflect the beauty and character of your home, a first impression so to speak. From your morning coffee, to that relaxing time following a hard days work - you will enjoy it more with a freshly finished appearance. Nobody wants to entertain in an area that does not reflect the care and attention given to the rest of the home. Just because it is outdoors does not mean that the beauty can't come shining through all the time. Deck building was created so folks could enjoy their backyard in the nice weather, why not make sure your haven is at its very best, ready for entertainment. Wood alternative Composite Decking such as Trex, Dekorator and GeoDeck have come a long way in perfecting their products and offer excellent performance for deck facing. Most composite products react the same as wood in the way it cuts, trims and fastens. Another advantage of composite is the low maintenance required. Most synthetic decking materials, primarily the higher quality ones, are sold with warranties against splitting, cracking, and insect damage. Give us a call and we can give you an idea of the benefits of composite decking and of wood decks too. We have developed some unique ideas for railings and guard fencing. Give us an opportunity to share some ideas with you. ​﻿﻿﻿There are many types of sealants and stains to suit your particular project. Opacity represents the transparency of a product, from clear to solid. There are some stains and sealants better suited for tannin rich woods like cedar and redwood. In most cases solid stains will wear and protect better than more transparent coverings but we never recommend covering cedar with solid stains, it would be a waste of beautiful wood. There are products available now that include oil primers and latex finishes or urethane finishes for more protection and lasting results. On new wood, much of it comes with a 'mill glaze'. Before finishing, the glaze should be cleaned and removed. When planning to restore and stain the deck or fence, the ideal conditions include temperatures above 10 degrees and no foreseeable rain for about three days. There are products that work under less than ideal conditions and should be researched. King City Property Service will sit down for a thorough consultation with the client to paint a clear picture (get it?) and make the decisions as simple as picking your favourite colour. 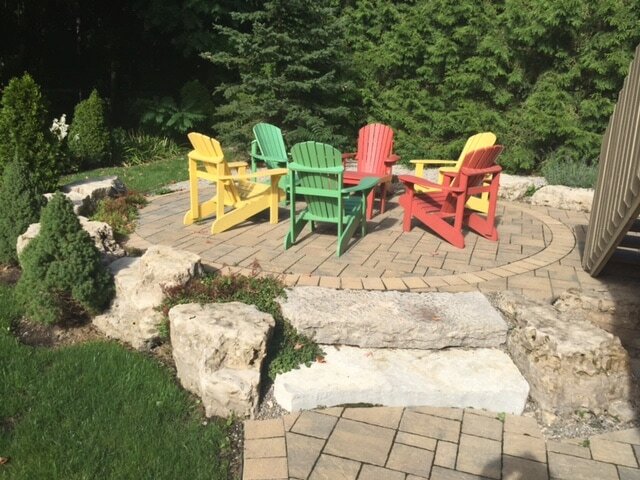 Keep in mind that any colour choice should be tested in an obscure portion of the deck to make sure you are satisfied with the finished look. 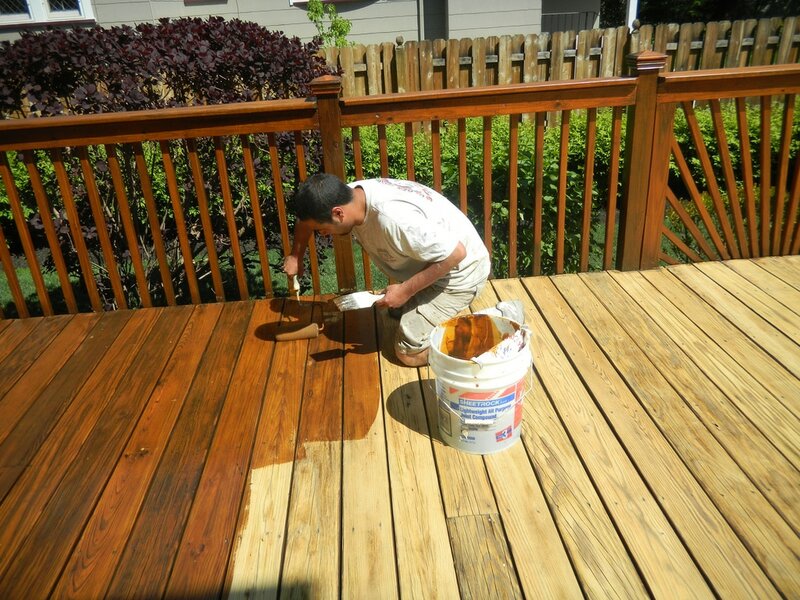 Make deck refinishing part of your home improvement program. When assessing a deck, we look first to the condition of the wood, not all older surface can take the prep that is needed to fully refurbish the wood. Does any of it need to be replaced or ​​will refurbishing do the trick? We examine the fasteners, any insect damage and possible rotting. We will assess your deck and make sure these potential issues are looked after. Then we will consult on the best plan of action for appearance and protection. A structurally sound and well maintained deck is an inviting extension to your living space and and goes a long way to increasing the curb appeal of your home.​​ Remember when your deck was first installed? We will bring that back! It will feel like a new deck at a fraction of the cost. Check all footings, posts, railings and repair as needed. Make necessary (and agreed to) repairs; Remove rusted fasteners, insect damage and any rotting. Remove the old finish; Lightly power wash the deck's surface and brighten the wood. Sanding, then buffing to condition the wood fibers. Stain & Seal to protect from the elements. Our safety equipment / employee training keep our people safe and insurance costs low - savings we pass on to you.